When the fish go deep you can send a squid jig down to the bottom or anywhere between surface and bottom. Jig the lure just off bottom or just above game fish no matter where the are staged in the water column. Attach any fully rigged squid to these jig heads for a unique articulated fish-attracting action. Works great with fully rigged fat squids and Z2 squids. Comes in white or glow. Add a light to the line so more fish see the lure. 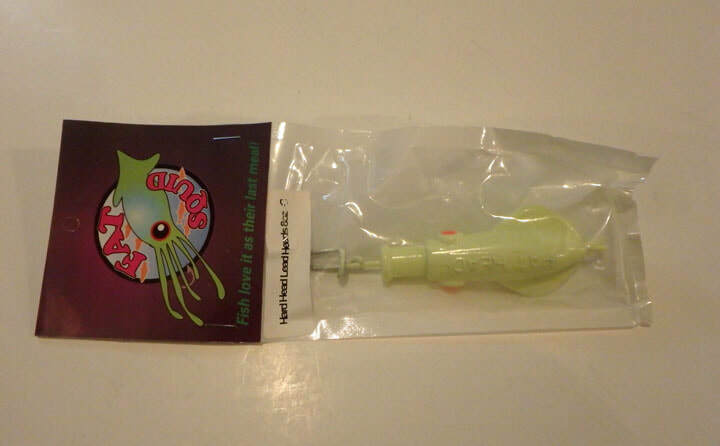 3 oz jig head attaches to any fully rigged squid to get down under the water. 3 oz jig head works best with shallow water, light currents or smaller fish. Get your squid lures down deeper with this 8 ounce jig head. 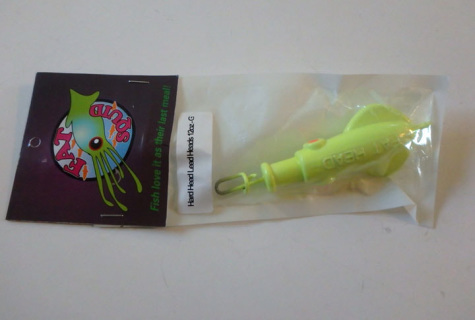 Corkscrew attaches fully rigged squid lures like Z2 or Fat Squids. Choose your articulated action with 2 line rings. 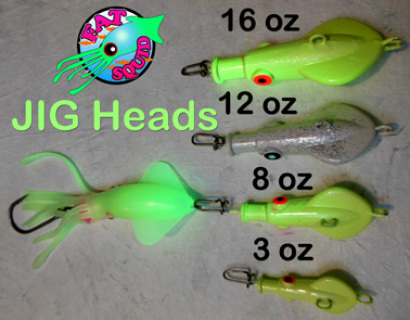 Get your squid lures down deeper with this 12 ounce jig head. Corkscrew attaches fully rigged squid lures like Z2 or Fat Squids. 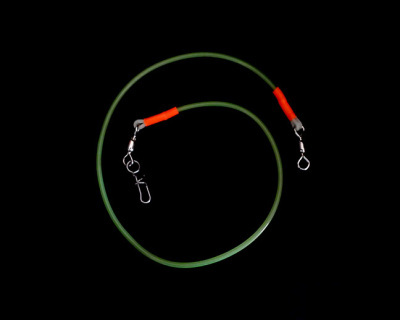 Choose your articulated action with 2 line rings. Get your squid lures down deeper with this 16 ounce jig head. 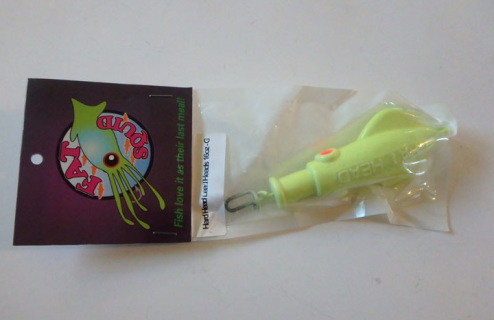 Corkscrew attaches fully rigged squid lures like Z2 or Fat Squids. Choose your articulated action with 2 line rings. Glow or UV leader guides fish to your lure. Heavy duty leader made from 500 pound test monofilament line with glow tubing. Swivel on one end and corkscrew swivel on the other for quick and easy lure changes. 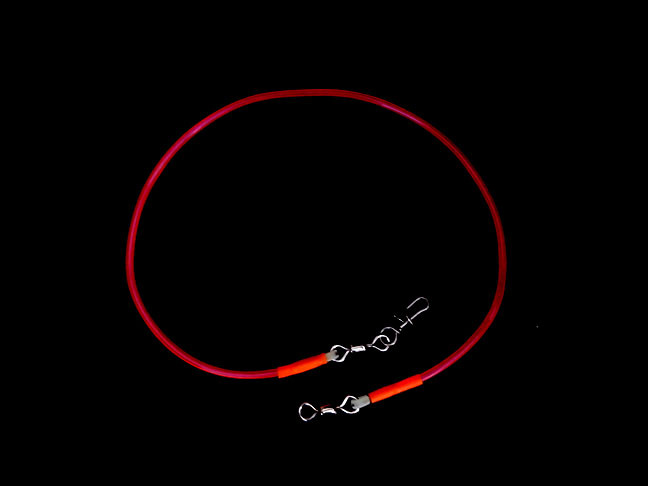 Heavy duty leader made from 500 pound test monofilament line with UV tubing. Swivel on one end and corkscrew swivel on the other for quick and easy lure changes. All orders ship by US Mail. Most ship next business day. Click product photo for larger image. SECURE CHECK-OUT! This site is for USA customers only. Foreign orders placed on this site may be asked to send additional money for postage before products ship. Avoid this delay by ordering at SquidLures.com.